A few weeks ago, I decided that I wanted to go somewhere to shoot the aurora. I had seen faint auroras as a kid growing up in northeastern Ohio and was treated to a surprise aurora display over The Palouse in eastern Washington state while out on a photo expedition last year. But this time I wanted to go where the Northern Lights would be putting on the best show possible, which would mean a trip to the great white north of Canada. There was a time element on multiple fronts that made it imperative that I drive way north as quickly as possible if I was going to have a good chance of success. "Mission Accomplished". There is plenty of parking at the end of the road in the Northwest Territories. Besides the ice road trucks, there wasn't another vehicle in sight. For starters, the sun is rapidly heading towards what is known as solar minimum. Our star goes through eleven-year cycles where sunspot activity rises and falls. Associated with sunspots are what is known as Coronal Mass Ejections, or CME’s for short. These events hurdle great amounts of charged particles into space. 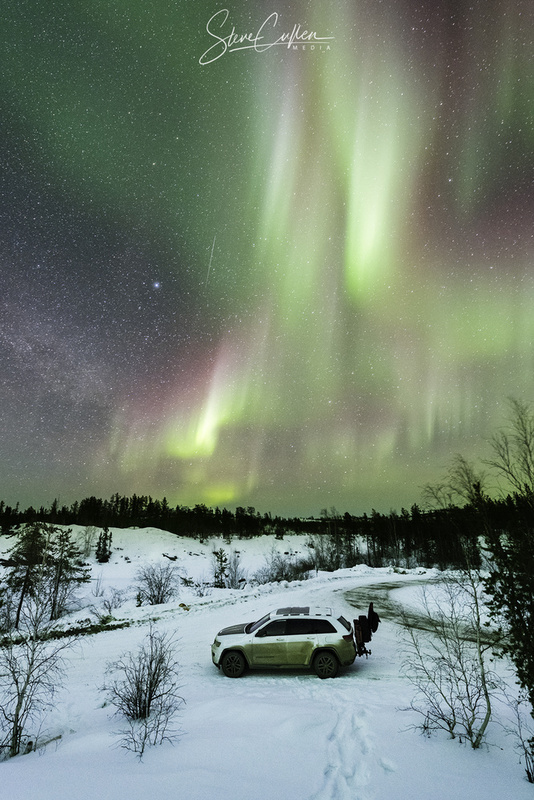 If it happens when Earth is in just the right position, the charged particles hit the magnetosphere and collide with oxygen and nitrogen atoms and molecules in the atmosphere and produce the spectacular light show over 60-miles high that we call auroras. Unfortunately, the sun’s surface has been devoid of sunspots for much of this year as the low period sets in. Fortunately, there is another type of activity on the sun which also tends to spew copious amounts of charged particles our way, it is called a coronal hole. And, there happened to be one opening up and sending the solar wind our way just as I was making my plans to go north. There is also something called the Russell-McPherron effect that tends to make auroras more prominent during the equinoxes, especially the vernal (spring) equinox. This phenomenon has to do with the speed and alignment of the solar wind to Earth’s magnetic field. When things line up, as during the equinoxes, the magnetic field forms cracks and allows more charged particles from the sun to flow in. It just so happens that the vernal equinox would occur right in the middle of my trip. And, finally, time was of the essence since by mid-April, the sky will be too bright in the north. The Northern Lights would be completely washed out by the night-long sunset glow. "Auroral Spendor". The Aurora Borealis bursts across the sky reflected in a rare area of exposed water in Yellowknife. I decided that the best place to head is a little town called Yellowknife in the Northwest Territories of Canada. You may have heard of Yellowknife as it was featured on the first season of the television series “Ice Road Truckers.” Seriously, any hint of drivable road heading north ceases at the end of Highway 4 (the Ingraham Trail) at which point you have to risk it on the seasonal ice road if you wish to venture any farther. What makes this town at the distant reaches of North America, situated less than 300 miles from the Arctic Circle, so appealing for photographing the Northern Lights? The main thing is that it sits directly under the auroral oval. This ring around the top of our planet is where the charged particles from the sun flow down through Earth’s magnetic field and make contact with those atoms and molecules in the atmosphere that I mentioned earlier. 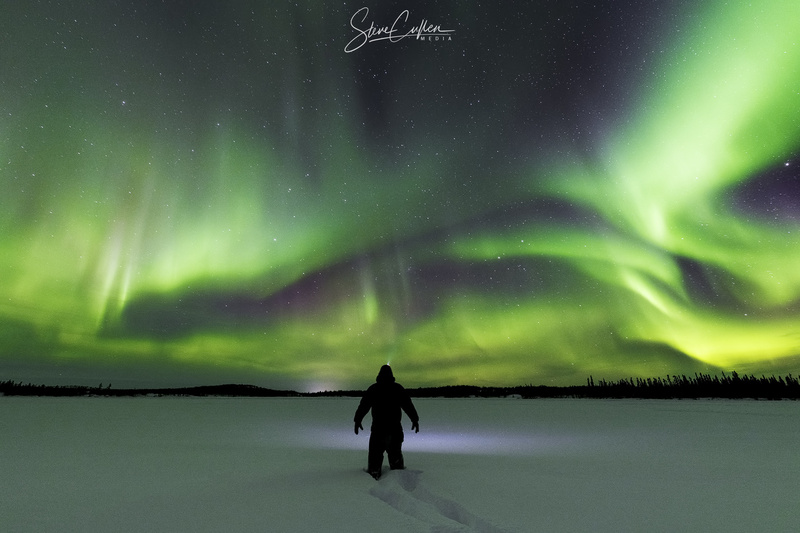 In fact, usually, regardless of what is happening on the sun, some amount of aurora is visible in the skies over Yellowknife every night that is dark and clear. Yellowknife also sits in the rain shadow of the local terrain, meaning it gets fewer clouds and precipitation than most other places in the region. Which, in turn, means there are more clear nights available to see the Northern Lights. "Boreal Forest". The landscape in the area of Yellowknife is dotted by lakes which are surrounded by boreal forests. Even in the dead of winter between the aurora, trees, lakes, and rock formations there is a unique beauty here that I didn't expect to find. With my destination chosen I packed my gear, lots of extreme cold weather stuff, and three cameras, and started out on the 30-hour drive to the end of the road. The first day of the trip would take me through the spectacular Canadian Rockies and Jasper National Park, one of my absolute favorite areas for photography. The second day was mostly through forest land which meant a lot of logging trucks and oil drilling machinery on the roadways. On the third day, I made my final push to Yellowknife, ensuring that I knew exactly how far I could drive and where the places to buy fuel were located. This region is about as remote as it gets so being prepared and knowledgeable is paramount to getting to where you’re going safely. Upon arriving, I checked into my room and got ready to head out and shoot. The forecast was calling for active aurora, clear skies, and no moon for the next few nights. Perfect conditions! As I made my way out the Ingraham Trail I was careful to stay out of the way of the supply trucks heading north to link up with the ice road and continue the 370 miles to the diamond mines. Already I could see the sky glowing an eerie green. I couldn’t make out the ribbons and curtains of light that you might typically see, it looked more like a green haze in the sky. I went to an initial location that I had “scouted” on Google Maps and felt relatively secure in reaching. It turned out, it was my indoctrination to driving on an ice road, as I quickly found out that most of the lakes in the region have them. Once out on the lake, I quickly set up my gear and snapped a few “insurance” shots. NASA does the same thing when they land somewhere new. These are perhaps not the best pictures possible, but they at least capture the essence of the area and give you something to show for your efforts should everything go badly from that point on. "Outflow". The water seen here is an outflow from Tibbitt Lake. When the massive trucks travel across the lake on the winter ice road, the pressure generates waves under the ice which are eventually strongly felt and heard in the rushing of water in this exposed area. Feeling more confident, I headed to the end of the Ingraham Trail and found a rare area of open water with a pristine snowfall that would serve nicely as foreground elements for my shots. The only thing to contend with was the endless stream of outgoing and incoming trucks on the nearby ice road. Their headlights did not add a very flattering light to shots. Fortunately, for safety reasons, the trucks are on a pretty rigid schedule where they depart in groups of four every twenty minutes. I enjoyed this area so much, even though it was an hour plus one way down the road, that I returned there twice more during my stay. As the days went on, I was able to scout other potential locations, and then try them out at night. Luckily for me, during my nearly two weeks in Yellowknife, the aurora and the weather cooperated about 60% of the time. Some nights had better displays than others, but without question every night that the skies were clear there was a fantastic aurora to shoot. "End of the Road". On my first night, I drove to literally the end of the road in the Northwest Territories of Canada. 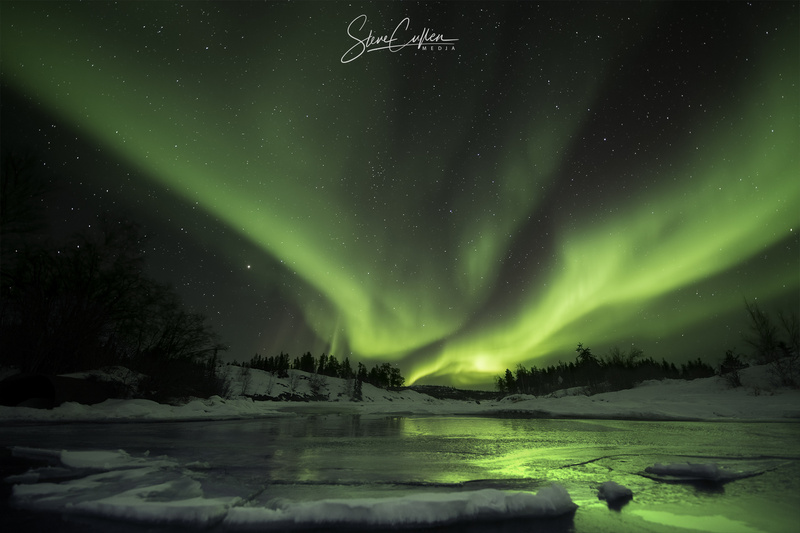 While standing on the frozen lake at 4 o'clock in the morning, the aurora exploded in a fantastic full-sky display of rippling curtains of purple and green light. 1. I didn't realize that at this latitude the Andromeda Galaxy never sets. It is the glowing slanted oval just to the left of center in my cover photograph. Being an astrophotographer for over a decade I never had a reason to ponder this issue. 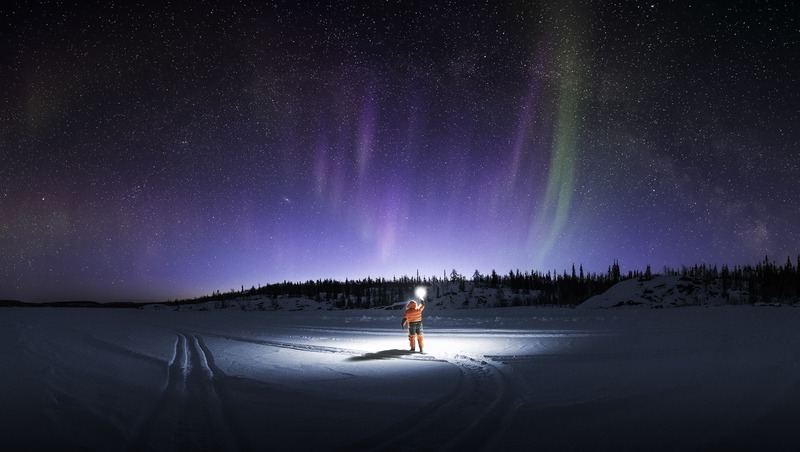 Standing out in the snow, under the stars and the blazing aurora, your mind certainly has a good chance to wander. 2. This is the only Milky Way season for folks this far north. By late April the sky will be bright enough all night long to wash out the Milky Way. 3. You can't get those big arching Milky Way shots here in Yellowknife. 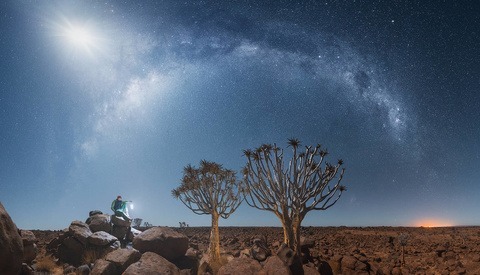 You've seen those images where the galactic core is blazing away above the horizon with the stars in the disc of the galaxy arching across the sky. 4. At -25°F the luminance noise in photographs is pretty darn low. It was really that cold with a wind chill of about -40-°F on one of my nights out. You seriously have to prepare for the extreme cold both with what you wear as well as for your camera gear. 5. My mirror froze in the up position quite often, which would cause the camera to display an error message. This wasn’t too much of an issue on single shots but if I was shooting time-lapses it was a real struggle. 6. Plan to use the aurora as an element in your compositions, like you would the Milky Way. It can be, but most of the time shouldn’t be, the star of your photographs. It should primarily be there to support an interesting foreground. You will come to learn how the aurora “behaves.” Sometimes it appears to be rushing towards you, sometimes away from you, and sometimes it comes down right on top of you. Over time, you’ll also get a sense for when the display looks like it will kick into overdrive (an amazing sight) or when it is going to die off into a faint glow. Use these cues to your advantage when framing and compositing your shots. 7. You can apply many of the same photography techniques to aurora photography as you would with other nightscapes. For example, shoot the foreground separately from the sky and then composite them in post. For the foreground, shoot it with longer exposure times, lower ISO’s, and smaller apertures to get the sharpest, cleanest images. Mean combine multiple foreground images in post for even less noise. For the sky, shoot anywhere from 20-30 seconds with long exposure noise reduction turned on. 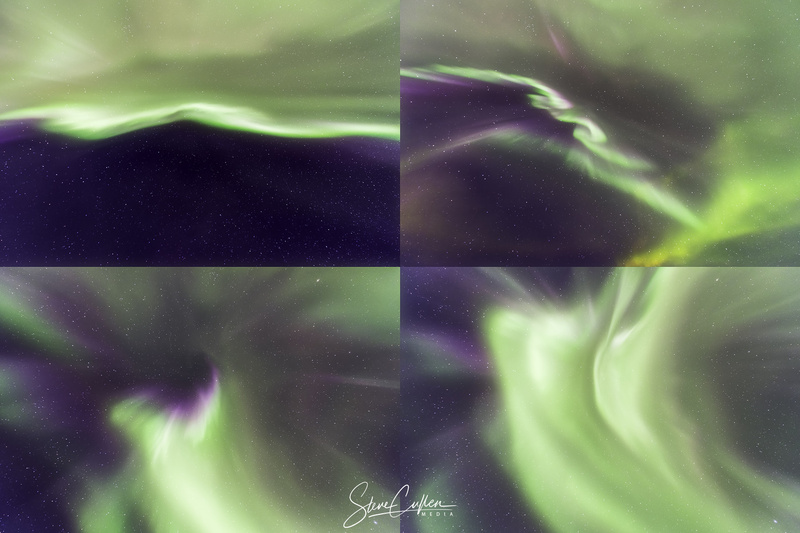 You can’t really mean combine multiple aurora sky shots like you can Milky Way images. The de-rotation and registration (aka alignment) on stars will make the aurora look odd. 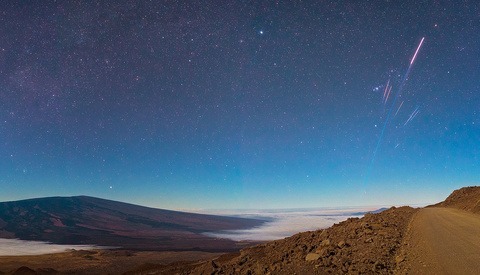 So, get the best single-shot images of the sky you can. 8. Here are some tips for your photography gear. First, acclimatize your camera to the cold, set it outside wrapped in plastic for at least 30 minutes to allow it to cool down closer to the ambient temperature. Second, be sure to bring chemical heat packs and rubber bands. The heat packs can help keep you warm but by affixing them to your lens with a rubber band, you can keep frost from forming on the glass. Third, be prepared for your tripod legs to freeze up. My tripods have the twist locks on the legs and many times the twists or the legs would get stuck in position. I have heard that the clamp locks are better for cold weather, perhaps that is true? Fourth, keep your batteries warm. The Nikon EL-EN15’s that I use in my Nikon D810A and D850 performed admirably in the cold, but I was sure to keep a set of batteries warming in my pocket at all times. "Zenith". Standing directly below the incoming flow of charged particles from our star, the Aurora Borealis at the zenith is a psychedelic managerie of violet and green against the inky black backdrop of space. At this point, you are close to missing this window for shooting auroras in the northern hemisphere. But if it interests you at all, start planning for the fall when the weather will be relatively warmer, there will be less snow on the ground, and the water will still be mostly unfrozen. 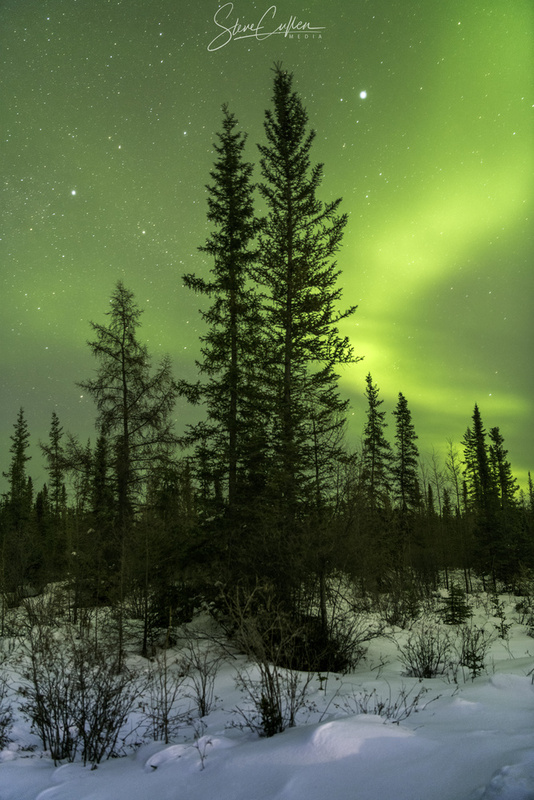 And, pay Yellowknife a visit, it’s a remarkably interesting town with ultra-nice people and the Northern Lights are ever-present to put on a spectacular sky show for you. Almost like we were there with you! Great article and photos Steve Cullen. WOW! Great article! Awesome images! Thank you! Thank you for the comments Nate! fantastic photos - fantastic insight into the process to find them - thank you Steve. You're welcome Jim. I'm glad you got something out of it! Great article, and worth pointing out that going further North than Yellowknife actually reduces your chances of seeing a great display. It's a combination of weather (no clouds) and just the right latitude for the best displays. The "end of the road" in the NWT would be Tuktoyaktuk, which is many, many hundreds of miles further North than Yellowknife. But Tuk doesn't have great weather, and it also is getting too far North for a spectacular display (although it would be wrong to imply you don't see the lights in Tuk, you do ... just not as "big" as in Yellowknife). 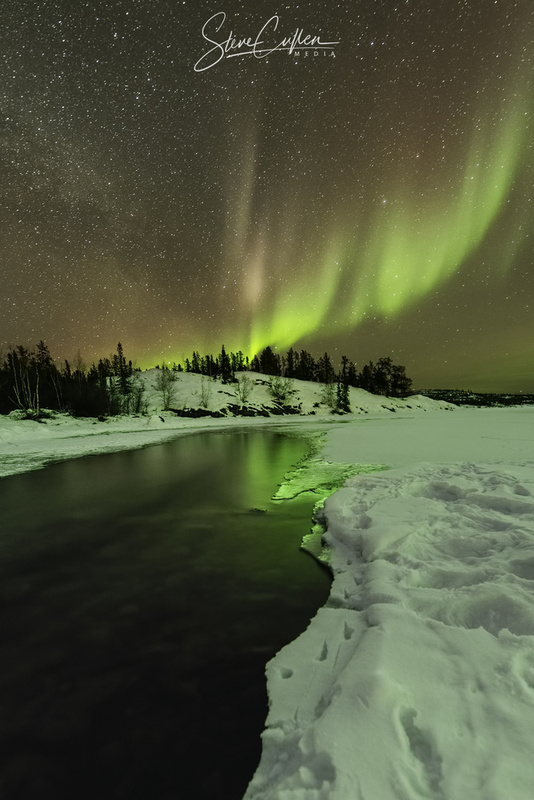 But your article is excellent in that it describes Yellowknife as the "best" place to see the lights, with it's combination of perfect latitude, and excellent winter weather. Great article and images. Thank you! That "Zenith" collage is killer, Steve. I love your tagline too (traveling 15 days a month), I'm trying to work towards something like that as a digital nomad—I'm sure I'll be nerding on vehicles and road trips to the Pacific Northwest soon! Thanks Jonathan! Let me know if/when you're coming up my way, we'll go shoot (if I'm around <g>). For sure. Southern Oregon (Bend / Crater Lake) will hopefully happen this summer! BTW, my understanding is that Tuktoyaktuk is the farthest north you can drive. It is about 150km north of Inuvik along the Dempster Highway. 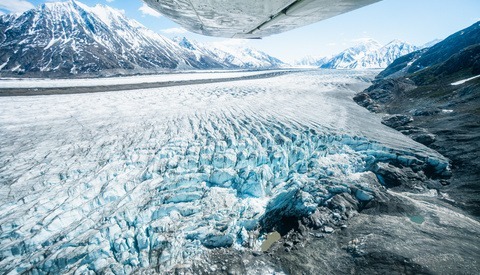 Highway 4 the Ingraham Trail...one day...Great shots. Looks like a trip of a lifetime. yeah,warm clothing, no kidding. I am from Montreal, not the same weather but warm clothing we have :-). This winter wonderland is something I would love to experience. Great article and read. 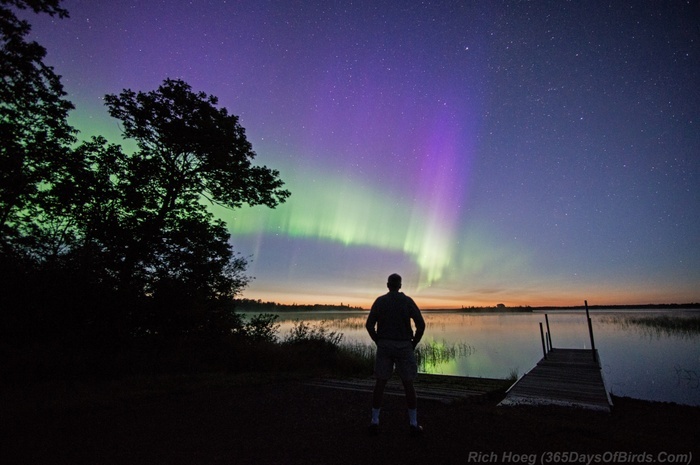 Just a fyi for your readers one may photograph the Aurora in northern Minnesota during the summer. While the displays are nowhere near as frequent as in Yellowknife, we do have 4 to 5 hours of true darkness each night in the Summer. The area near the Canadian border is rated almost perfect by Dark Skies. Thus, if the Aurora forecast is good you will often find me at a remote lake in northeastern Minnesota doing astrophotography. My only issue sometimes is the huge numbers of mosquitoes that may be present! Another great Northern Lights expedition is to take the Norwegian coastal ferry service, Hurtigruten, up to the Arctic in the winter. My wife and I combined our love of cross-country skiing with the night skies two years ago with a trip to Tromso. The Norwegians have lots of ski trails, and after dark we would chase the Aurora! I decided to add one follow up comment. Here is an image/selfie I took in early August of an Aurora Borealis display in the pre-dawn light around 4 am in northern Minnesota on Greenwood Lake. I had been out all night chasing the Aurora. While the fall and spring equinox periods are the best for capturing displays, as noted previously summer is possible in northern Minnesota. Absolutely amazing photos!! Just stunning! Great article! Thank you so much for sharing this beautiful experience with the world. You're welcome Helen. Thank you for stopping by and reading it!